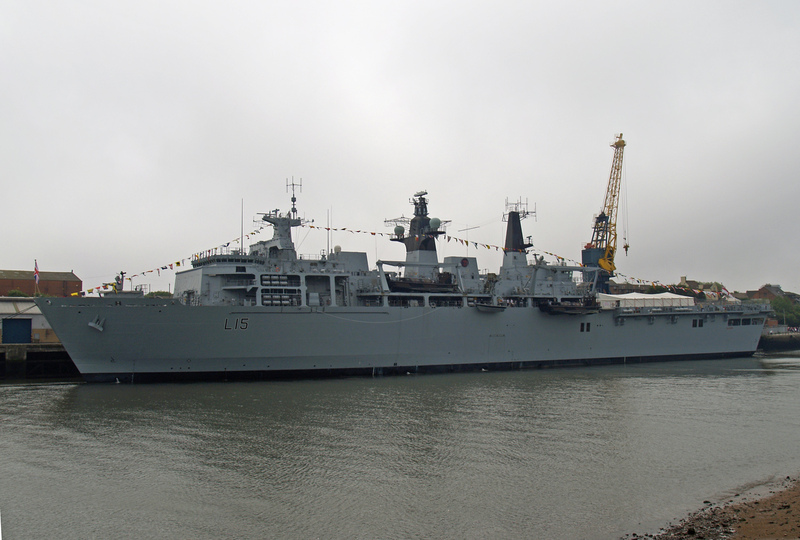 HMS Bulwark - L15 seen here at Corporation Quay, Sunderland (North East England) on 3rd June 2007 whilst making a courtesy visit. Photographed from the North side of the River Wear. HMS Bulwark, the second of a new class of assault ships, was launched at the BAE Systems shipyard at Barrow-in-Furness on 15 November 2001. The seventh ship to carry the name, she was named by Lady Walker, the wife of General Sir Michael Walker. Speed: 18 knots, range of 7000 nm. Propulsion 2 x 6.25MW & 2 x 1.56MW diesel generators driving two AC motors through twin shafts and a bowthrust unit, all operating at 6.6KV. RNs first integrated Full Electric propulsion ships. Military Lift: Embarked Military Personnel (EMF) 305 troops, with an overload of a further 405. Vehicle deck capacity for up to six tanks or around 30 armoured all-terrain tracked carriers. Floodable well dock, with the capacity to take either four utility landing craft (each capable of carrying a Challenger 2 tank) or shelter a hovercraft landing craft. Four smaller landing craft on davits, each capable of carrying 35 troops. Two-spot 64m flight deck able to take medium support helicopters and stow a third. Deck is capable of taking a Chinook. The Albion design does not have a hangar but does have equipment needed to support aircraft operations.